This is a syndicated post by Michael Stanley-Baker that first appeared at https://recipes.hypotheses.org/5844 It is reproduced here with the author’s permission. Drugs, be they plant, animal or mineral, were important objects for trade, cure and even spiritual salvation throughout Chinese history even until today. They appear in all sorts of diverse sources, from poems and diaries to scriptures, pharmacopoeias and recipe books. The historical record for the early imperial period (221 BCE – 589 CE) indicates that the majority of health care was provided by religious specialists– Daoists, Buddhists and mediums–and that doctors were in a very small minority. Knowledge of a particular signature drug could mark a certain group’s identity, forming a means through which they showed their own therapeutic knowledge, while also distinguishing them from other players in the medico-religious marketplace. Knowledge of what drugs did, and access to them, either through physical access in the regions from which came, or through knowledge of how to identify them, could play an important part in religious identity. Thus, simply having a drug “name” leaves a lot untold. 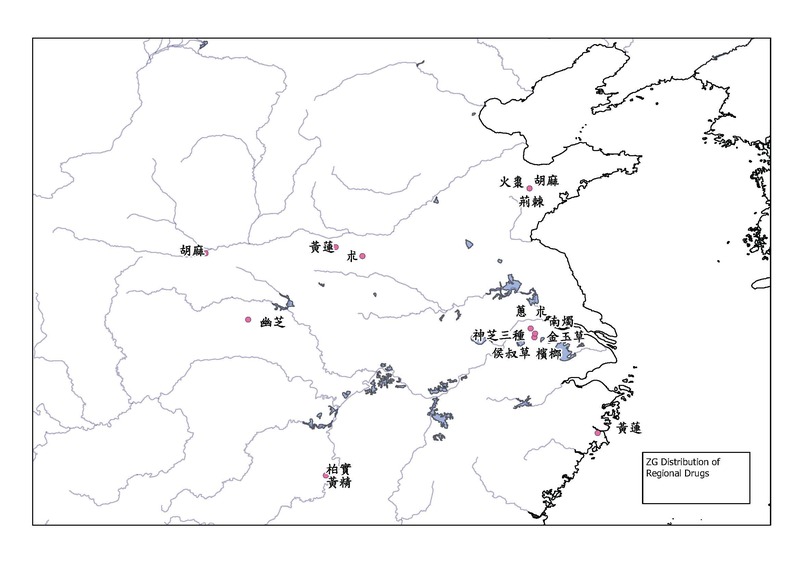 Unifying projects, like state-sponsored pharmacopoeias, as well as modern botanical dictionaries that make equations between traditional Chinese names and modern botanical identities, do a lot to conceal the diverse processes by which drugs circulated in pre-modern China. Substitution, modification and the use of alternate names were common practices in this period (and still are today). The geographic origins of a plant or animal product also had an impact on its efficacy, and also on the fact that it could under different names in different regions. 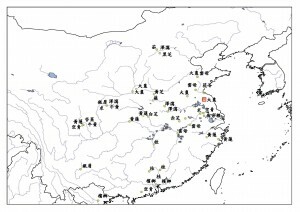 However, the history of Chinese pharmacology has largely been devoted to tracking changes in different pharmacopoeic editions over time–the editorial staff on each project, increases in quantities of drugs, and development of plant knowledge, such as the identification of new species or sub-species of plants. 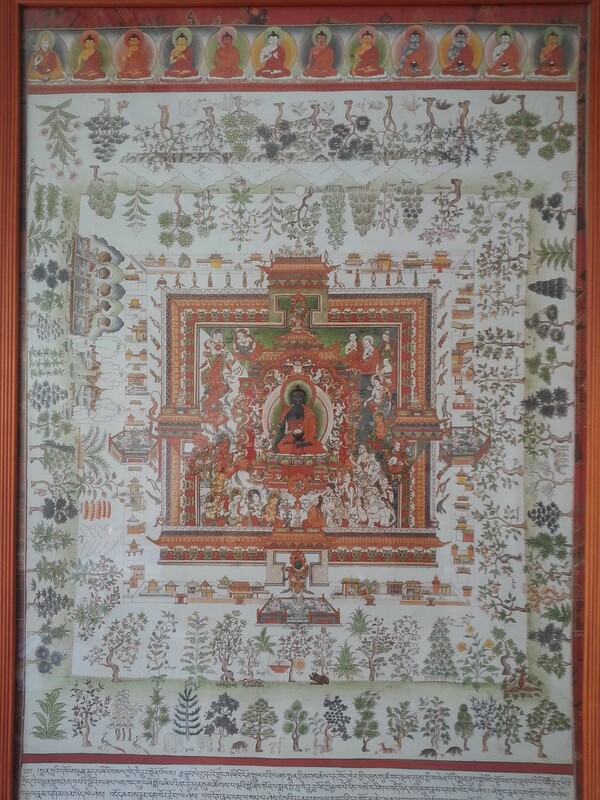 This approach works within the normative limits of the state-recognized and medically authorised knowledge, but studies outside of this domain are largely limited to anecdotal stories of Daoists revealing isolated recipes, or Buddhists providing healing to the laity. 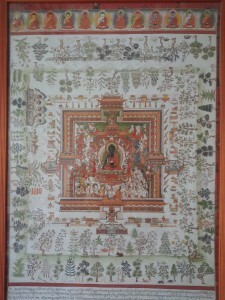 There have been few overall, systematic studies of drug lore in other domains – like the Buddhist or Daoist canons, for example. To what extent does the data in the Daoist canon back up the anecdotal claim that Daoists were the major stake-holders in early drug lore? Which sects, in which periods and times, were most active in drug lore, and were they actively competing with other sects from the same time and places? 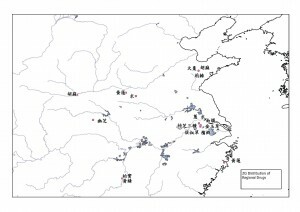 This image plots out the locations described for 36 drugs in the Daoist text, the Zhen’gao 真誥 DZ 1016. At the Max Planck Institute for the History of Science, Shi-Pei Chen and I are developing a digital solution to help answer such questions. This will better situate early Chinese drug knowledge within the multiple contexts, times and places in which drugs took on new meanings and interpretations. We will expand the study of Chinese drug lore into what has normally been considered “religious” literature, and perform a variety of analyses on digital transcriptions of early materia medica. We are considering the following open access repositories for transcribed, digital editions of the Buddhist (see the repository here) and Daoist canons. We will do statistical analysis of the texts in the Daoist and Buddhist canons to establish the frequency of drug terms in the texts, to see how much of the pharmacopoeia figured for these actors. Based on general metadata about those texts (as available/reliable), such as date (or date range) and place of composition, author or sectarian affiliation, we can better analyse the circulation of drug lore across time, space and community. Using GIS place name authority databases (CHGIS, CCTS and DDBC) we will associate historical place names with GIS points. This will enable us to use time-space displays to show the distribution of drug knowledge across time and space (we are considering PLATIN, see sample applications here). This image plots out the locations for the same 36 drugs, as they appear in the Bencao jing jizhu 本草經集注. Both texts were edited by the same person, Tao Hongjing 陶弘景, between 492 and 500. – Both maps were made with QGIS, and appear in Stanley-Baker, 2013, p. 172. We will then select interesting or important texts for closer study, and use an automated text-marking system, MARKUS, to markup individual texts in detail. We will focus initially on DRUG NAMES, DRUG FUNCTIONS, LOCATION NAMES, and PEOPLE. This will enable us to compare regional associations about drugs in Daoist and Buddhist texts against those in the pharmacopoeic tradition. For example, whether and how recipes vary across texts, whether the same places are identified as centres for drug supply or transcendent use, which drugs or sets of drugs circulated through which communities. The pilot study is limited to the Six Dynasties period (220-589), a time which had the most formative influence on religious institutions, and the conclusion of which saw the establishment of the first imperial medical academy. In later stages of the project, we hope to invite scholars working in other periods, regions, and languages to collaborate with us. If there is enough interest from the medical history community, perhaps together we could create a research infrastructure to study drugs across the pre-modern world. If you would like to join this venture in its future stages, please contact us! Stanley-Baker, Michael. 2013, Daoists and Doctors: The Role of Medicine in Six Dynasties Shangqing Daoism PhD Thesis, London: University College London.